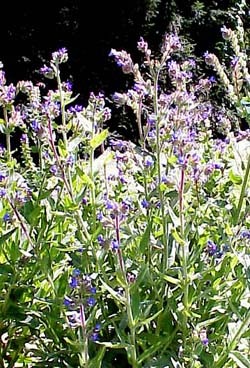 (Bugloss) A biennial, bringing beautiful clear purple-blue flowers to the garden in June and July. It has been used as a diuretic, and to induce perspiration. The root decoction was thought to have blood cleansing action. Said to be effective when applied topically for ulcers and injuries to the skin. The plant is a biennial, preferring dry, sandy soil and full sun. Hardy through a wide range of zones and generously self-seeding, an individual plant can produce 900 seeds. Although sometimes an unwanted volunteer in hayfields, it is indispensable in hummingbird and bee gardens, where the lovely trumpet-shaped flowers will easily attract these busy visitors.